The illustrated book TIERREICH / ANIMAL MASSES is published in summer 2010 by Knesebeck. This magnificent volume brings together the most beautiful photos from the project. The book tells the story of some of the greatest animal spectacles the world has to offer. A visual delight for everyone who loves Nature. 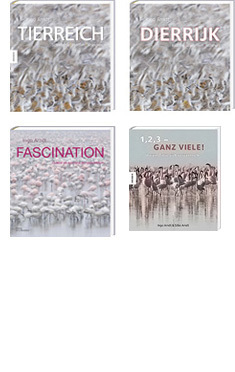 We have a German, Frech and Dutch edition available. Since March 2012 the children's book "1,2,3 – ganz viele!" is also published (German edition only).